Just a year on from the presentation of its future-focused NEXT 100 vision vehicles, the BMW Group introduced the electric mobility of the much more immediate future at the IAA Cars 2017 show in Frankfurt. 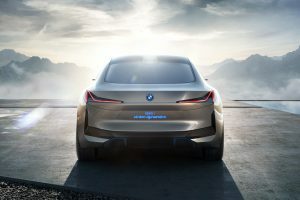 The BMW i Vision Dynamics is a four-door Gran Coupe with a range of 600 km (373 miles), a top speed of over 200 km/h (120 mph) and acceleration of 0-100 km/h (62 mph) in four seconds, and offers a look ahead to the e-mobility experience of the future with a new level of sporting elegance. 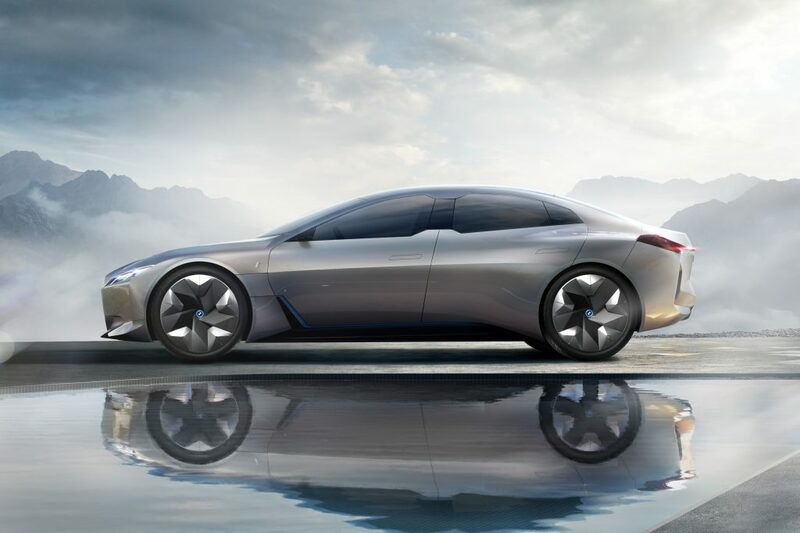 The outline of the BMW i Vision Dynamics represents a further evolution of the classical BMW proportions; a long wheelbase, flowing roofline and short overhangs create a basic profile brimming with elegance and dynamism. This silhouette is fleshed out by large, fluently contoured surfaces, the exterior appearing as if cut from a single mold. Aerodynamic requirements define the car’s progressive appearance down to its details. Barely visible joins and the flush integration of glass into the main body lend the study a modern and technical overall impression. The tension between large surfaces and finely worked details points to the innovative technology at the heart of the car in an understated yet intuitively appreciable way, rather than advertising it in grandiose fashion. 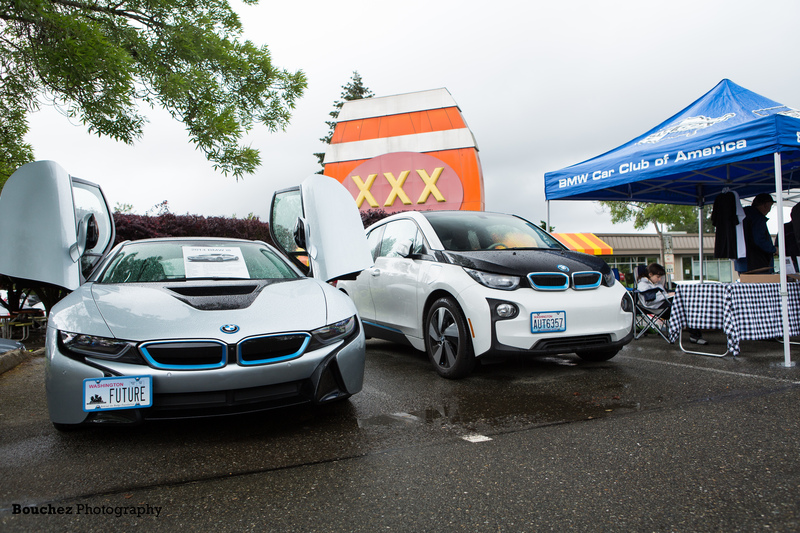 And that is very much in keeping with the identity of BMW i: “I do more with less”. Within the smoothly flowing, neatly aligned progression of the surfaces along the car’s flanks, the new characterization of the window profile is a standout feature of the BMW i Vision Dynamics. This iconic styling cue, which made its debut on the first wave of BMW i models, is depicted here in a fresh, likewise function-led interpretation and also sharpens the identity of the car’s flanks. Their virtually symmetrical form allows all passengers an equally good view out, highlighting the attention paid to the passengers and the shared driving experience in the interior. This is something that will gain further in importance in the future, in particular as far as (semi-) autonomous and connected driving is concerned. The distinctive driving experience is further enhanced by the full-length glass surface running from the windscreen to the rear window. This heightens the sensation of room and enables a feeling of spaciousness and freedom inside the car that belies its dynamic exterior silhouette. Viewed from the outside, the unbroken roof graphic reinforces the enclosed, modern feel of the exterior thanks to seamless transitions through the front and rear end. The prominent, enclosed “kidneys” in the minimalist front end bring together the past and the future of BMW in more than just styling terms. 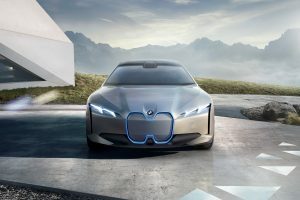 Where the BMW kidneys have previously acted as a symbol for the company’s expertise in drive system development, the BMW i Vision Dynamics deploys them as declarations of technological know-how. Indeed, underlying sensors turn the kidneys into an “intelligence surface.” The headlights similarly combine tradition and the future. The classical BMW four-eyed front end is reprised here in a very modern and pared-back interpretation, two intricate, freestanding LED light elements on each side of the car’s nose integrating all the necessary lighting functions, yet also providing an extremely striking look characteristic of BMW. Smooth curves guide the car’s horizontal profile when viewed from the rear and add poise and power. The tapering of the passenger cell creates broad shoulders and a muscular presence. The most eye-catching feature of the rear end is the L-shaped lights. Their slim cut underscores the dynamic efficiency of the vision vehicle on a detailed level, while at the same time accentuating its wide stance on the road.